As a keen DIY enthusiast, you may be the right sort of person to buy property for the purpose of becoming a landlord. Many landlords buy property that needs a bit of work to bring it up to standard. That’s where your DIY skills come in handy. These properties are cheap to buy, and if you do the work yourself, you can make a huge profit. Even if you don’t rent the property out, you can sell it for more if you do it up to a good standard. To get your ‘doer-upper’ ready for a tenant or to place back on the market, you will need to make it look good. This requires dressing each room for its purpose. 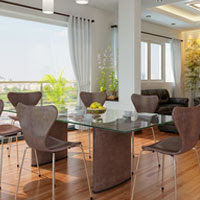 Even if you’re not renting it out fully furnished, placing furniture in the rooms helps people imagine living there. Start by painting each room. The ceiling, coving, skirts and doors should be white. Avoid vibrant colours on the walls. Feature walls are lovely, but they are rarely done to meet everybody’s taste. Use wall art to create focus and interest in the room instead. This could be modern and impressionistic. Swirls and curves or geometric shapes in bold colours work really well. Bring out that same colour in floor rug for the living room, and in the cushions for the couch. Finally, choose some readymade curtains to save you time. They will make the property look far more homely, and may be a legal requirement in some places. With flooring, you have two choices. You can choose a cheap carpet that may need to be replaced each time you change tenants due to wear and tear. Alternatively, choose a wooden or tiled flooring that your tenants can keep clean and will last longer overall. If you are selling, you may just want a basic carpet but hardwood floors are more attractive. As a rental it is essential the flooring is put down professionally, so it is safe for the tenants. Often, changing the doors to something modern can really tidy a place up and make it look attractive. They can usually be bought cheaply at your local DIY store, but hanging one on your own is tricky. You can also choose attractive door handles to finish them off. Some flats require the doors to be fire safe, so check the rating conforms to your local standards. Give the windows a thorough clean on the inside as well as the outside. Nobody wants to rent a place that looks dirty. The kerb appeal is important. Check the window sills are clean, and give the gardens a good tidy. If there are a lot of plants, you might want to consider cutting it back and removing it. Tenants may not be willing to look after a mature garden, so opt for something that is easy for you to manage as a landlord. Finally, your property is ready for people to move in. Air the place thoroughly by opening all the windows for a couple of hours to let the breeze blow the stale air out. Add a vase of fresh flowers on the table, and you have created the ideal home for someone.